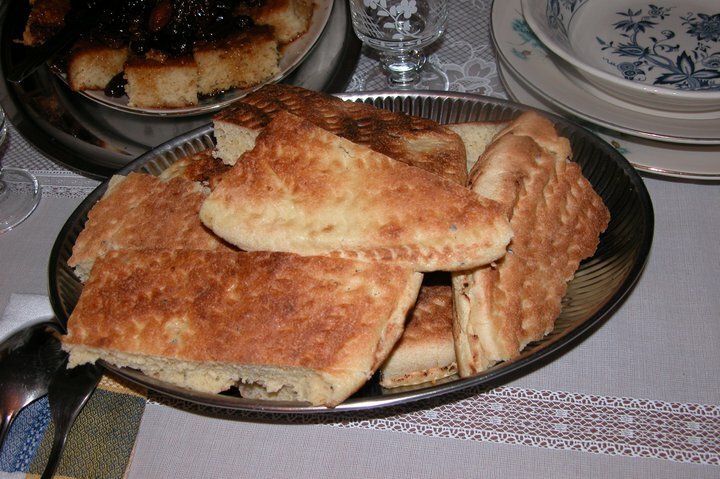 Kesra Matlou, Algeria’s staple bread……..
bread ( khoubz in arabic, Aghroum in Amazigh dialects ) symbolises Allah’s sustenance ( rizk) and is closely connected to one’s roots….family and cultural identity. 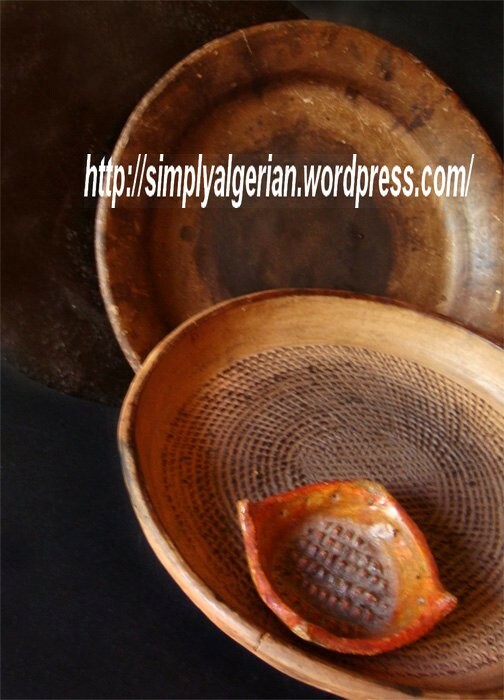 In Algeria , like in many other parts of the world , there is a long list of proverbs and idiomatic expressions with the term » khoubz » or kesra, ksour (plural of kesra) » reffering to life’s basic necessities, money and general living conditions….. Bread is so highly respected that it’s considered a sin to desecrate it . when finding a piece of a bread in the street, ,people would bring it close to their lips and forhead as a sort of reverence then put it aside so no one would step on it. 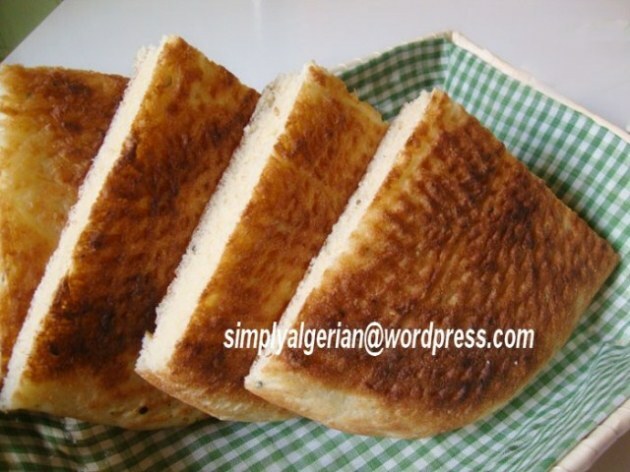 in this outstanding metaphoric passage, , mohamed Dib, one of Algeria’s significant litterature figures of french expression , brillantly describes the deep connection between bread, his love for his mother , and the yearning of past childhood memories…. likewise…in his beautiful poem ( ila ummi /to my mother) palestinian revolution poet Mahmood Darwish depicts his longing for his mother, her bread, and his lost sweet memories . Why authentic ? 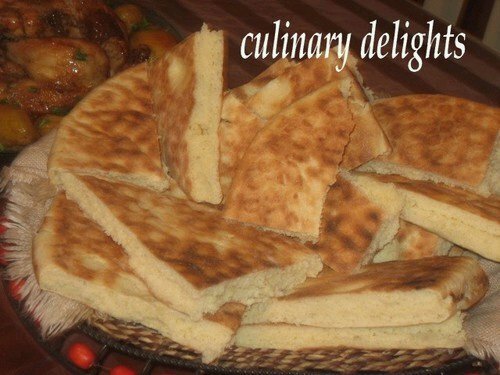 : because the recipe respects the true matlou method that calls for double-stage kneading….the first one with little amount of water so we can thouroughly knead the dough and the second after adding more water to get a fluffy result. Why modern ? 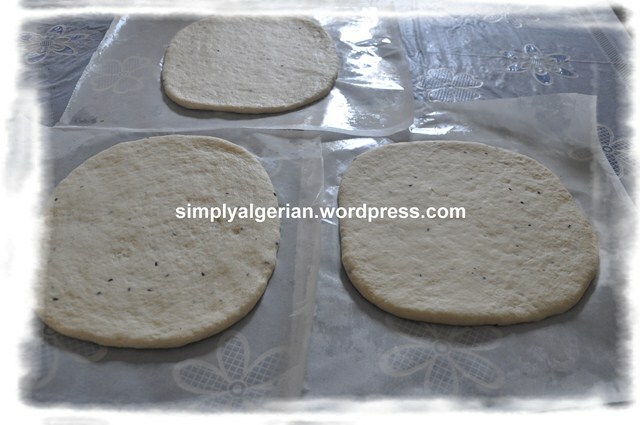 : because handling the kesra galette and carring it from the working surface to your tajine/cooking pan is a very delicate step , the dough is so soft and that you can easily damage the shape…..traditionnaly we would use our bare hands a a type of towel that doesn’t stick to the dough but kouky invented this clever way of using parchement paper aand solved all the complicated details connected to the kesra cooking. 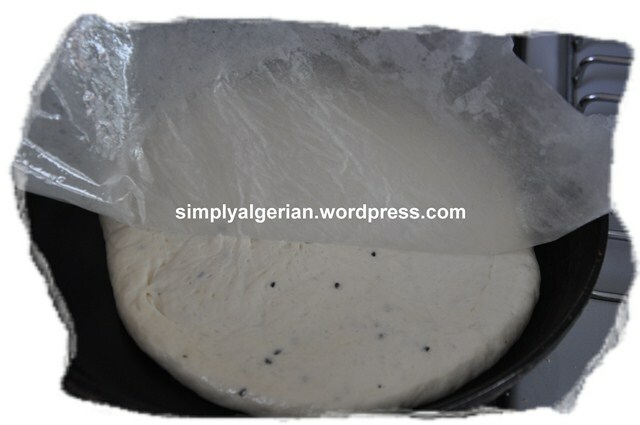 adding milk powder is another modern twist that make the kesra softer and more delicious. 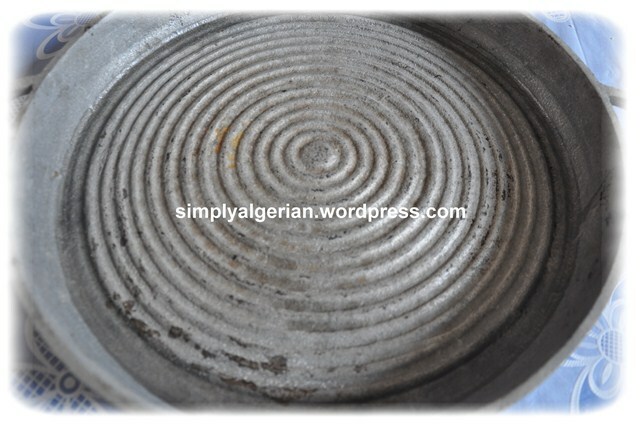 This is my a 60 years metal tajine, handed to me by my late grandmother who bought in Algiers during world war II , or » guerrit lingliz » as she used to say . I don’t use it often but I dearly keep it as a souvenir of my grandmother and an erra that no longer exists. -Mix well and slowly add about 300ml of warm water. 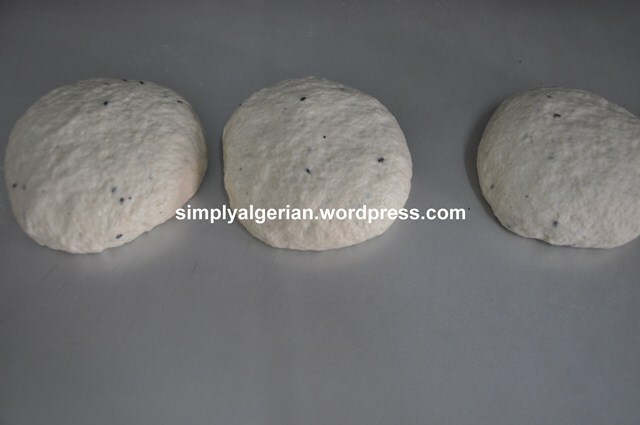 Cover and set aside to allow the dough to absorb the water . knead vigorously by gradually adding the rest of water ( I added 50ml ) . This step helps release the gluten that will be respensible in giving a spongy and light bread. you might use your bread machine during this step. punch down the dough. divide into 2 or three portions . incorporate a nab of softened butter into each ball. place it on a pre-oiled sheet of parchement paper. -flatten each ball into a large disc. Cover and leave in a warm place intil it doubles in size . this might take between 1/2h to more than 1h, depending on the season. 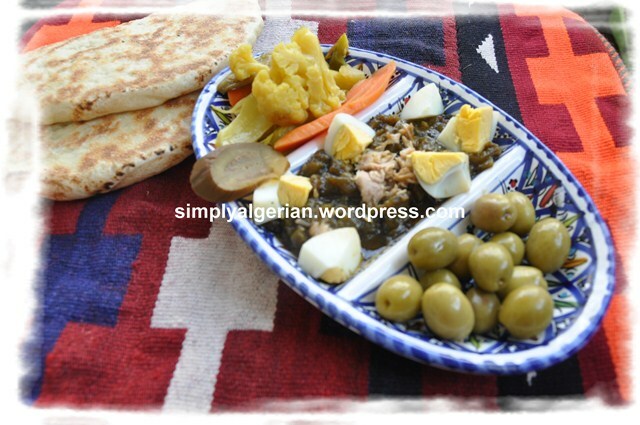 preheat the clay tagine or any other iron skillet /pan of your choice. lower the heat, prior to cooking . Carefully peel the parchement paper , poke it with a tooth- pick or a knife and rotate now ad then to avoid burning the bread. with a help of a large spatula , flip it to the other side and let it cook until golden brown. Reprendre la pâte, la dégazer délicatement et la partager en 2 ou trois selon qu’on veut de petites ou grandes galettes. Les petites étant plus faciles à manipuler. Laisser refroidir couvert d’un torchon propre avant de découper et se régaler avec un tajine, un h’miss ou simplement avec du beurre et du miel!